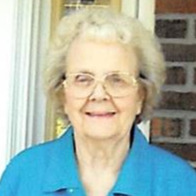 Isabelle "Izzy" Lucille Kuester, 97, of Pleasant Hill, MO (formerly of Kansas City, KS), died April 4, 2019. Visitation will be 12:00-1:00 PM with Services beginning at 1:00 PM Wednesday, April 10, at Porter Funeral Home, 1835 Minnesota Ave. Kansas City, KS. Burial in Johnson County Memorial Gardens. In lieu of flowers the family suggests memorial contributions to the American Cancer Society, American Diabetes Association or the charity of your choice. Isabelle was born October 21, 1921, in Kansas City, KS to Leonard and Margaret (Shull) Postlethwaite. She was a seamstress at Wee Winnie and later she did store demos. Isabelle was very active at Stony Point Christian Church until her health wouldn't allow her to do so. She was a Past President of TOPS (Take Off Pounds Sensibly). She was preceded in death by her parents, her husband Bernard Kuester, and three sisters; Margaret Metzger, Betty Flood and Catherine Yockel. She is survived by her children John Kuester, Kathy and her husband Kent Adkins, Chuck and his wife Linda Kuester, six grandchildren and 14 great grandchildren.